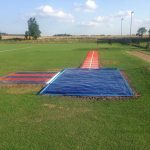 A triple jump landing pit is a key part of any outdoor athletics facility, and we are able to install these to fit many sizes and requirements. This is the area that the athlete will land in when they have completed their jump, so it needs to be safe and correctly installed. It will typically be filled with silica sand, and a number of different edgings are available depending on the client’s preferred design. We have fitted these along with full runways at many locations across the UK. Organisations which commonly ask for this kind of product include schools, leisure centres and athletic clubs. Please feel free to contact us if you would like any more details on what we can do for you. 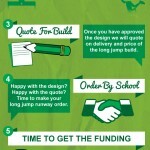 Simply fill in the contact form and we’ll get back to you to discuss the costs of installation work. The primary function for the triple jump landing pit is to record the distance jumped by the athletes using the track and also to make sure that when they land they have a comfortable surface to land on. This makes sure that the facility is safe to use by everyone. 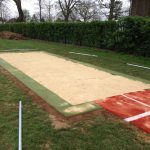 If you are planning on using your sports surface for recreational use, the size of the landing pit can be made smaller to suit your budget, giving you more freedom over the customisation and the price for the final facility. 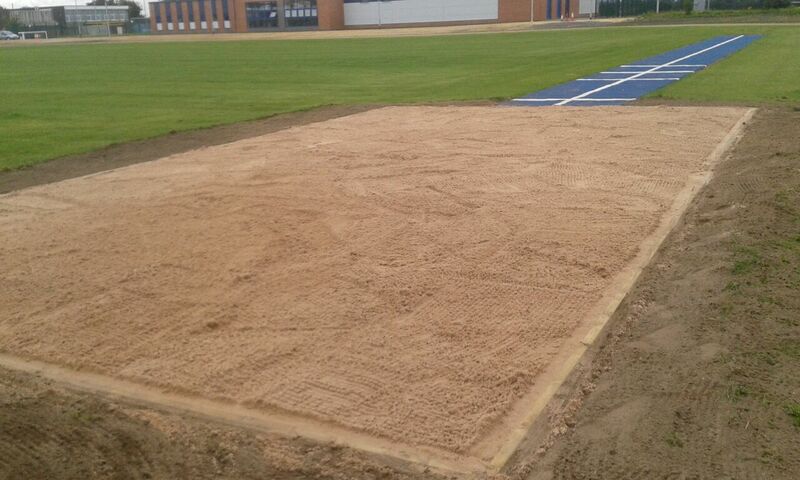 We are able to fit different edgings around the perimeter of the sand box including rubber or concrete. The specifications for this can vary depending on the overall design and what the client would like. Recreational and professional surfaces will have some differences, so be sure to let us know what kind of facility you need. If you are a primary school you may not need such a big landing area as there are children using it. 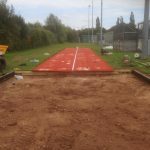 However if the triple jump landing pit will be used for competitive and professional use the size and dimensions must meet the criteria set by IAAF standards agency. 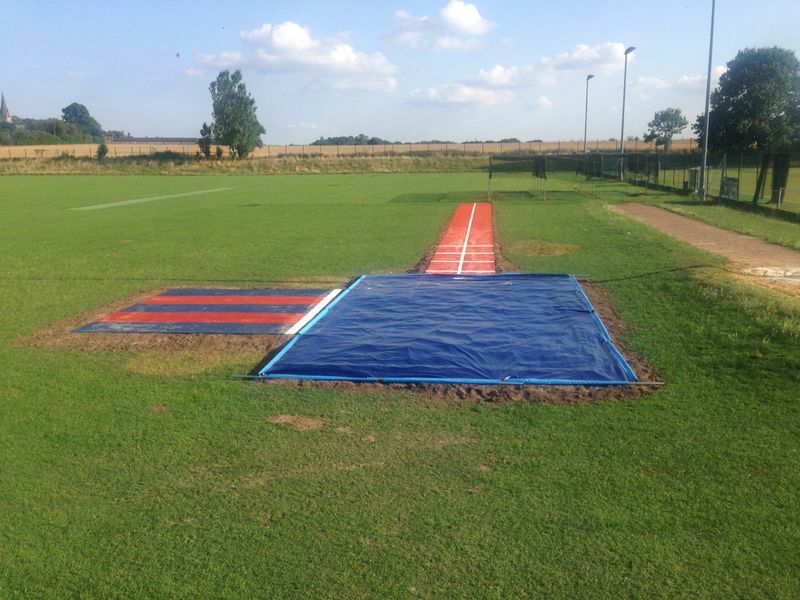 The standard triple jump facility size set by the IAAF is 9 meters by 2.75 meters, we recommend that if the institution that is getting the facility installed is a secondary school, you get a landing pit as close to the regulation size as you could have some hidden talent in the school! Numerous athletics clubs as well as schools have begun to get more affordable facilities set up for sports and athletics. Lots of academic institutions are unable to get athletic facilities renovated, meaning young children miss out on athletics opportunities. Generally, academic institutions simply can’t afford to renew the facilities or they haven’t got enough room for the construction. Compact athletics facilities are created to fit current spaces and budgets, together with supply useful, motivating areas which people of every age group and abilities may better their physical fitness and even self-confidence. By making use of these, kids are able to improve running, jumping and even throwing skills which are a part of the FUNdamental steps of enhancement. In academic institutions these facilities are meant to develop the children’s running, jumping and also throwing, together with multiple activity participation into athletics. Several widely picked facilities include things like shuttle run tracks, discus areas as well as jogging tracks and of course the triple jump landing pits and runways. Multi activity spaces can be produced by installing a single track; this can be used for long jump, relay races, hurdles and many more. For schools with a shortage of space or money, this can be a perfect substitute for a full-sized running track. As the individuals may take part in many activities, a few might find a particular one which they like and want to continue on at a qualified sports centre. A major deficiency in existing sporting supply is a shortage of developmental facilities which are suitable for a beginner and young people at the first stages of the athlete growth model. Athletics should really be brought to young children as early as key stage 1, key stage 2 and also improve skills to key stage three and key stage four. A new set of guidelines has been produced by UKA to be certain that athletics facilities become more widely available to younger people. The plan provides educational institutions with more compact, recreational high quality features that could be designed with a vibrantly coloured, fun appearance for young children. For companies struggling with budget and also outdoor space, the compact athletics facilities produce a ideal solution for teaching simple FUNdamental skills in a selection of sporting activities. A number of institutions tend to have multi use triple jump run ups or other running tracks installed within their compact sports facility. Wherever there’s small space, we can reduce the size and design of specific sports facilities. The flexibility of compact athletic areas implies that they are relevant to an array of situations. Present sport and play provisions in primary schools, high schools, universities and colleges may be enhanced by installing the compact sports and athletics facility. By taking part in different athletics events, children from Key Stage One-Four all can better leaning and fitness abilities. Much more children may be motivated to participate in the brand new sporting events if they have a top quality and appealing facility readily available for them to utilise. Compact facilities are a cost-effective option offered to virtually any school or athletics club. In terms of FUNdamental skills of athletics, more children are capable of leaning and practising running, jumping into safe landing areas and throwing through a variety of activities. The creation of a broad network of compact athletics features is a major factor of UKAs aspiration to capture the interest and demand for the sports activity. Since the IAAF and IPC World Championships are going to be held in London in 2017, it’s predicted that more young people will begin to get involved. When using these compact facilities, kids could find a particular activity they enjoy and could join a qualified sporting club – helping to improve participation in athletics. The triple jump sand pit costs will vary depending on the size and dimensions for the sand pit in question, as obviously the bigger the sand pit the more expensive it’ll be to make due to increase in materials needed. 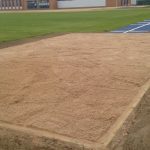 The size of the sand pit doesn’t have to be to the criteria set by the IAAF for some institutions, this allows for the client to help stick within their budget by reducing the overall costs and invest the savings on another aspect of the facility or something entirely different. We recommend that you take into account the costs of maintenance within the budget of your project, through a thorough cleaning schedule you can ensure that your surface will have a much longer product life. 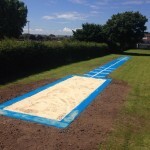 Even though this may seem like an unnecessary expenditure, it’ll make sure the surface is completely safe for those using it and the triple jump sand pit costs should be seen as an investment. 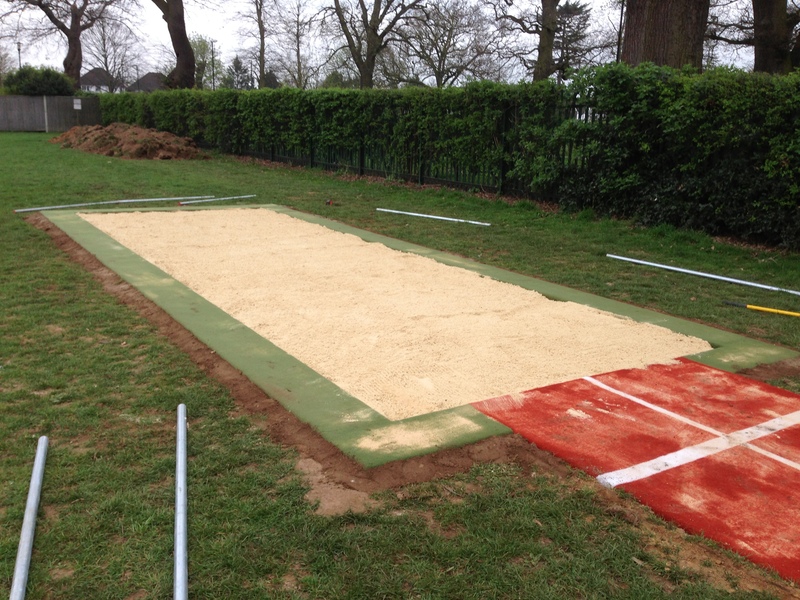 We also supply a specialist triple jump sand pit cover to protect that area when it is not in use. If you don’t look after the surface properly, it will start to become dirty and damaged over time, so it’s good to keep it clean. We strive to give the best possible services and products for the best possible price to ensure happy customers. 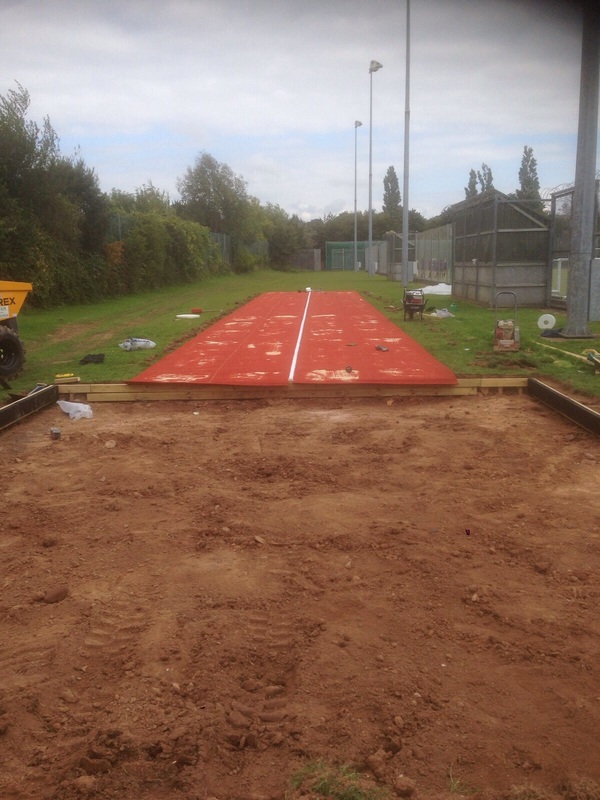 If you are interested in having a triple jump landing pit and run up track fitted at your facility, please don’t hesitate to contact us today for more information. One of our experts would be happy to discuss the work with you and provide a great value quote. Just let us know what you’re looking for and what your budget is so we can make the process as cost effective for you and your school or club.